The Scottish Football League has produced a 40 page Programme for Wednesday’s first CIS Insurance Cup Semi-Final between Dunfermline Athletic and Livingston. The Programme has extensive coverage of both finalists including interviews with the Dunfermline management team of Jim Leishman and Craig Robertson, veteran duo, Scott Thomson and Andy Tod, midfielder Gary Mason, and strike partners, Mark Burchill and Noel Hunt. Similarly, the Programme has interviews with the Livingston management team of Paul Lambert and Norrie McWhirter, defenders Dave Mackay and Harald Pinxten, midfielder Martin Scott, and forwards Paul Dalglish and Robert Snodgrass. There is also a feature with Dunfermline’s Youth Development Coach, Hamish French, and Livingston’s Director of Youth Development, Graeme Robertson. French played in the Dunfermline sides that last reached this stage of the competition back in seasons 1996/97 and 1997/98, whilst Robertson also played in a Semi-Final for the Pars back in season 1989/90. 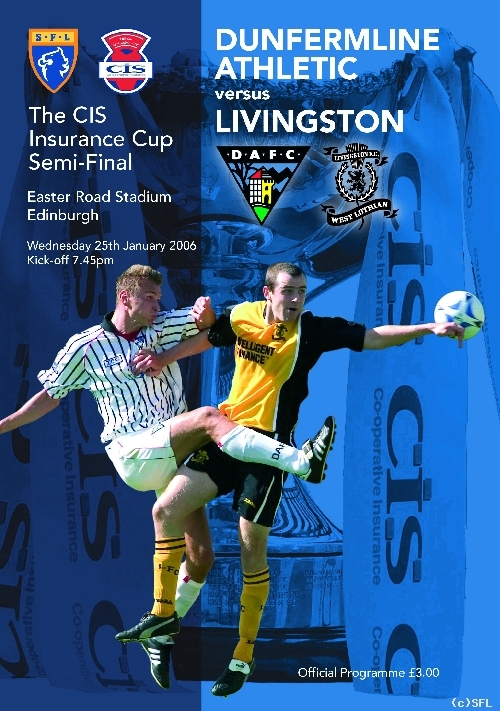 There are also extensive player profiles on the respective squads of both Semi-Finalists and in addition, other features include articles on the match officials, a detailed report on Dunfermline and Livingston’s “Round by Round” Road to the Semis, detailed statistical information as well as a number of action packed photographs. Wednesday’s Official Match Programme is available both outside and inside Easter Road Stadium priced £3.00 and is an excellent read. For all Pars and Livi fans, it is a souvenir worth treasuring. Programmes priced £3.00 plus postage are available directly from the League’s Programme Publishers, PPL Sport & Leisure Ltd., and for further information, contact them on Tel. No. 01372- 743377 or alternatively, by clicking on to their website, www.pplsport.com.